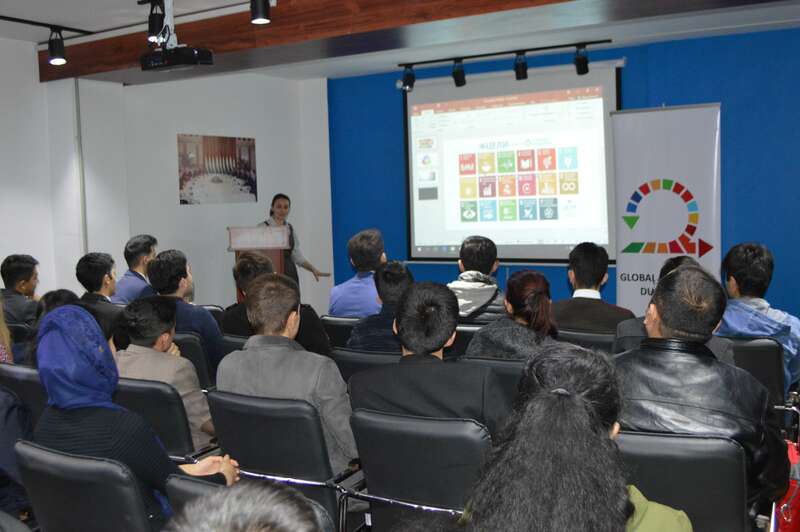 On 29 November 2017, the second Hackathon to design #2030Now (Global Goals Jam) was held at the UN Information and Resource Center in Dushanbe, Tajikistan. The Center filled with ideas and energy when almost 60 university students came together to compete at the second Global Goals Jam. The second event in a row gave the participants a possibility to voice their opinion on how to solve and tackle challenges standing in the way of achieving Sustainable Development Goals 4 (SDG4) on quality education and Sustainable Development Goal 5 (SDG5) on gender quality by the year 2030. Farida Shohkosimova the National Education Officer of UNESCO in Tajikistan introduced the young audience with the themes and challenges for SDG4 (Quality Education). They divided into teams and each team had two challenges to solve. The teams competed for creative ideas to respond to specific development issues in Tajikistan. They emphasized ideas and solutions that could be implemented realistically. The challenges related to quality education posed questions: how can we make early childhood education accessible to places currently with no kindergarten or early childhood education centers; what role can skills and lifelong learning play in achieving SDG4 that calls for all girls and boys to complete free, equitable and quality primary and secondary education? One of the challenges was specially designed to raise awareness of #16Days Against Gender-Based Violence campaign and the teams were asked what could be done at household and community levels to prevent violence and protect women and girls from violence. All teams presented their ideas and the winning teams would be invited to SDG Talks to present their solutions once they were fully thought through and the ideas were crystallized. Finding sustainable solutions for development takes a collective thinking and an exchange of ideas. The Hackathon in Tajikistan follows the global initiative for #GlobalGoalsJam 2017, organized by Media LAB Amsterdam, part of Amsterdam University of Applied Sciences (AUAS), together with the United Nations (United Nations Development Programme). In Tajikistan, the UN Volunteers together with UNESCO and UN Women organized the event.